Dr. Oz diet has a simple concept: Sleep at least seven hours, do not skip breakfast, eat colorful fruits and vegetables, and learn to cook, breathe deeply, socialize, dance and smile more. Apply these simple tips recommended by Dr. Oz and after only a few weeks you will feel great and lose excess kilograms. Immediately to note that this is not a revolutionary “Dr. Oz’s green coffee diet" which many internet portals without the approval and confirmation of nutritionists began to publish and write from memory after the popular show. We will not write about it but we will suggest a proven and healthy way of weight loss so let’s start. Laugh every day, except relieving stress, laughter lowers blood pressure, strengthens the immune system and social relationships. So have a wide open door for humor, laugh at jokes, friends, co-workers or the adventures of the characters in sitcoms and movies. For this there are serious scientific studies that indicate that laughter as medicine really works preventively on our overall health but among other things, removes excess kilograms. Smile and spread positive energy, except healing yourself you will have a positive effect on your environment. Dr. Oz diet begins each day with a healthy and nutritious breakfast. Those who eat breakfast are slimmer than those who skip it. Always start the day with a healthy breakfast rich in fiber. Eat oatmeal with raisins and walnuts, and before lunch you will tantalize unbearable hunger that may occur during the day. At every meal should be full of color – especially lunch. Vivid colors are the right choice full of flavonoids and carotenoids, powerful compounds that bind free radicals and reduce inflammation in the body. Instead of vitamin supplements, eat nine handful of colorful fruits and vegetables daily. Reveal new vegetables that contain a beautiful color and contains a higher amounts of minerals, vitamins and omega 3 fatty acids. Dr. Oz advises that whenever you have the opportunity to try a new type of vegetables do it. Also you can certain types of vegetables prepare in a new way, a healthier and more interesting one. 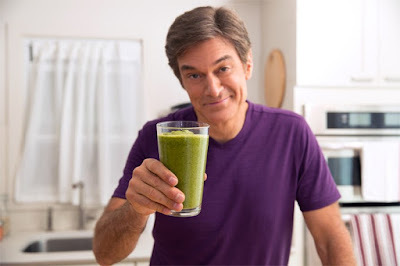 Dr. Oz diet is very simple, you must follow the following plan. Every day when you wake up, tell yourself that you will adhere in the next 24 hours to the plan and remind yourself why you are doing it. Dr. Oz diet has a unique concept - every day do something new-that will help you become more aware of its habit. It can be climbing stairs instead using lift or going to bed earlier. Dr. Oz recommends very interesting trick - lock the kitchen 3 hours before bedtime. If you give in to temptation to eat something you have not, do not waver and feel guilty about it, but only a start day from the beginning. You do not have to wait until the next day, every moment is an opportunity to get back on the right path. If Dr. Oz diet is your choice then do not give up and find excuses. Dr. Mehmet Oz recommends that you must replace sweets for healthier foods. Diet Dr. Oz asks you to relax with yoga and deep breathing whenever you have the opportunity to do so. First exhale then breathe in through your nose until your lungs are completely filled with air. It will expand you blood vessels, and supply it with oxygen and you will feel happier and calmer. Yoga reduces stress, lowers blood pressure and heart rate, and relaxes the muscles become more flexible, while reducing the risk of injury, deep breathing is the key to good health. Aside from yoga our recommendation is daily walking 30 minutes of recreation in nature and it is necessarily do stretching exercises. Dr. Oz diet definitely recommends you to drink green tea for weight loss, because in addition to eliminating excess fat and weight, this tea boosts natural immunity, repairs damaged cells, improves concentration and mood. Also green tea contains polyphenols which protect against cancer and strengthen the heart. Go to the sleep at exactly the same time: Do not deprive yourself of it, because seven hours of restful sleep will not only extend the life but also relieves stress, sharpen the memory and reduces the desire for calorie and unhealthy food. Dr. Oz diet recommends that you follow a strict regime when it comes to sleep. If you have major problems with sleep, read our article on the treatment of insomnia. We believe you will find these recipes useful for your health and you will apply them. Dr. Oz recommended this diet in his TV show. For least an hour during 7 days sweat properly and it will significantly reduce the risk of heart attack, blood pressure will be lower, the mood is much better, the muscles will become more efficient and body will be tougher. It has long been known that brushing your teeth is not enough for a complete oral hygiene. Dr. Oz recommends daily use of dental floss, because you will improve the hygiene of your oral cavity. Bacteria increases the risk of gingivitis - (gum inflammation), and recent studies have shown that the risk of heart disease is higher in people with poor hygiene of mouth. Also dental floss will help eliminate bad breath. If Dr. Oz diet got you interested, it is not bad to apply the following trick. According to research women eat 71% more from transparent dishes - so Dr. Oz advises to use ordinary plates. One of the tips to reduce your appetite is that instead of flowers, you decorate the table with fruit because it is proven that the smell of the fruit works on our appetite, and will help not to over eat. It is very important to do a self-examination like weighing or having a regular control of blood pressure, blood sugar, cholesterol and waist measuring. If the waist, which should be measured once a month, in women is greater than 89, and for men of 101 cm, there is an increasing risk of diseases such as high blood pressure, diabetes, and stroke and thus double your risk of premature death. People in middle age suffer from high blood pressure and are at increased risk of heart attack and stroke. High blood pressure can cause a range of serious health problems, including cardiovascular disease and chronic kidney disease says Dr. Oz. Unfortunately every third person has a problem with high blood pressure and is not aware of it. Therefore regularly measure the pressure - every day at a time, even when you are relaxed. If the systolic (upper) pressure is over 140, visit your doctor. Dr. Oz diet will certainly help with these problems. Dr. Oz diet recommends in addition to sleep, healthy eating, nature walks and regular-almost daily weight control that you always have a good look at your overall health condition. Obesity is the trigger for cardiovascular disease, hypertension and gout, but women who are 162 cm tall should have less than 79 kg and men who are 175cm tall less than 89 kg. In each additional 2 cm in height you can afford 2 kg more. Regular measurement of blood sugar can determine the risk of diabetes. Symptoms of elevated blood sugar are frequent urination, very strong thirst, and exhaustion: Dr. Mehmet Oz advises to react if the values are ​​above 7.8 mmol / L or below 3.3 mmol / l. Read more in our article diabetes symptoms. Bad cholesterol can be regulated by diet which can lower the level of bad LDL cholesterol to increase healthy HDL cholesterol. Dr. Oz recommends expulsion of bread, rolls and pasta from flour and fat from pork and beef and fried vegetables. To find out more please read our article good and bad cholesterol. At the very end we will summarize diet plan step by step. Step 1: Get to spring cleaning of the kitchen and fill it only with healthy foods. Step 3: With each meal, drink water, so you will eat less. Drink green tea because it encourages weight loss. Step 4: Stress can sabotage a diet, take some time to relax with laughter and good music. Step 5: Get some sleep, because if you sleep less than seven hours metabolism will slow down and the diet will not work. It is not just what we eat but where we eat. Try your best to eat in well-lit areas-because it has been proven that people in semi lit eat more. Dr. Oz diet goes to the smallest detail, so recommended is eating in the room with blue walls, because in these areas we eat up to 30% less than usual.